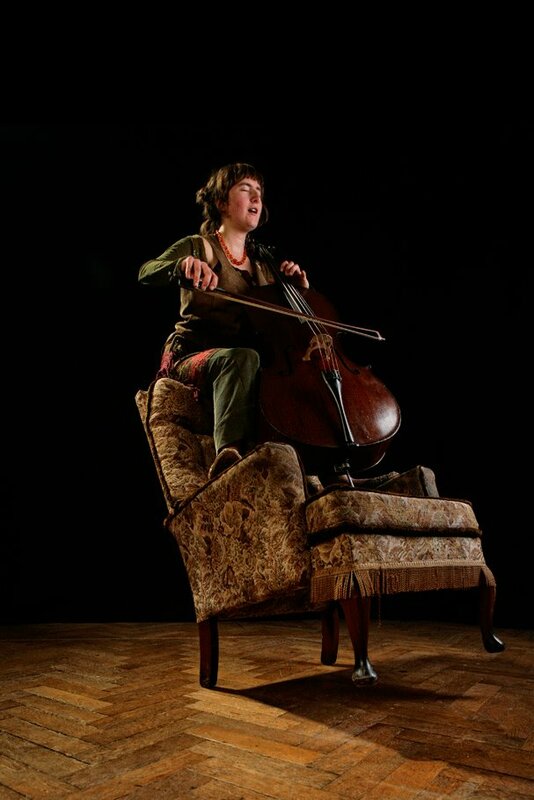 Ailsa Mair Hughes is an innovative cellist, singer, composer and improviser currently based in Taliesin, Mid Wales. She studied classically on the cello at the Royal Welsh College of Music and Drama and Cardiff University School of Music whilst singing in the BBC National Chorus of Wales and playing with Sinfonia Cymru. Now Ailsa’s heart lies away from performing classical music and she performs professionally in many creative projects, writing and performing unique songs for cello and her voice; collaborating with storytellers such as Martin Maudsley, Peter Stevenson, Milly Jackdaw and Sarah Mooney; weaving soundscapes with Bristol-based aerial/story/music/theatre troupe the Whispering Wood Folk; performing in dynamic duo Mackerel Sky with multi-instrumentalist Pixy Tom; singing in gypsy jazz band Chocolat and freelancing on cello with various other artists. She has also recently begun leading workshops in improvised singing. Ailsa is passionate about using music as a way of connecting people with each other and with nature.